Being busy is the norm these days. A demanding or hectic schedule, however, is not an excuse for a sedentary lifestyle or poor meal choices, especially through the holiday season. People assign different types of activities to the words “exercising” and “being active.” Physically demanding tasks, such as running or weight lifting, are associated with exercise. Being active, though, refers to everyday activities that involve a physical component, such as walking the dog or taking the stairs instead of an elevator. While high intensity training 3 times a week is recommended, just 30 minutes per day of activity has shown to be nearly as effective in improving and maintaining general health. If you take your child to football practice, try walking around the field. Four laps will be close to a mile and you can keep an eye on your child while getting in your daily activity. What you eat is as important as exercise. Nutrition labels are a great resource for making healthy food choices. If reading nutrition labels seems overwhelming, work on one item at a time. I recommend starting with sodium intake. According to the Food and Drug Administration, most Americans ingest 3-4 times the recommended daily allowance of sodium. Decreased amounts of sodium can positively influence heart and kidney health. Both in my personal and professional life, I have found that accountability is important when it comes to making decisions about diet and exercise. Hold yourself accountable. Set attainable goals and use a calendar to track daily activity. 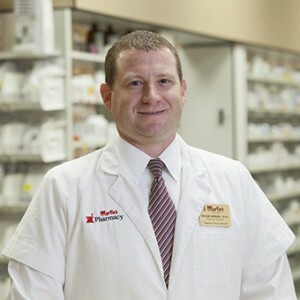 Don’t hesitate to ask your Martin’s pharmacist questions concerning healthy lifestyle choices. You are the most important decision maker when it comes to improving your health. Choose to make healthy living a priority. It is never too late to change habits and begin a new healthier and happier chapter in your life.